02) Previous page – World fading (Ancient 02) – The people’s possessions are from the ancient world. The figures are illuminated with strong, heavenly light & shadow effects. 03) Previous page – World fading (Modern 01) – The people’s possessions are from the modern world. The figures are illuminated with more subtle lighting. 04) This page – World fading (Modern 02) – The people’s possessions are from the modern world. The figures are illuminated with strong, heavenly light & shadow effects. This is my literal interpretation of verse 17 which states, “And this world is fading away, along with everything that people crave.” I have made the Christian couple’s possessions (stacked up behind them) translucent & fading into oblivion. 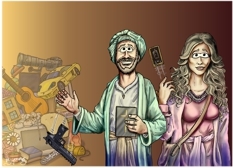 I have called this scene “Modern” to distinguish the people’s possessions in it (all of which are available today) from those of the Biblical era, the “Ancient” versions. Notice that the man is dropping a hand gun  & the woman is throwing a gold iPhone  over her shoulder! These are symbols of what many people would consider to be “valuables” today, in our modern age. 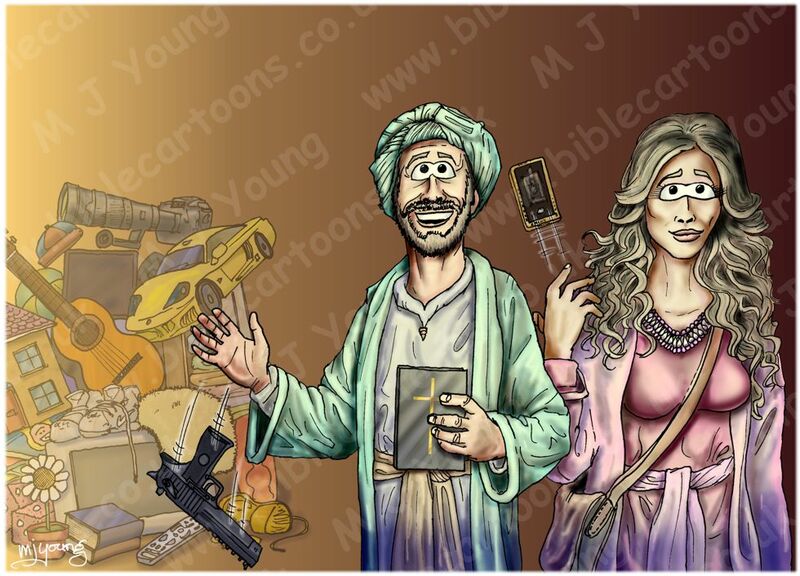 This couple have found a much more valuable treasure (Jesus in heaven) & so are ready to discard their earthly possessions in favour of a greater, heavenly one. The throwing away of side arms (hand guns; indicative of self-defence in a violent world) & an iPhone is quite poignant, since these items are considered “essential” by many people in the world today. No matter how much we might like such items, they won’t be needed (or available) in heaven! These items, & every other material possession we cherish today, will be left behind when we transfer into heaven at the end of the age. The couple in my picture are walking towards the bright light (which is in front of them & behind the viewer) which represents their eternal life in heaven, with the Lord God. I chose to illustrate a Desert Eagle pistol, .50 inch Action Express because it came up as one of the most expensive hand guns in my research! “Yep, another iPhone, this time the older 3G model. It seems that Apple design really inspires designers to add their own personal touch- one that’ll cost you a fair few pounds. The iPhone 3G has a 3.5 inch screen, a 412 MHz processor, 128 MB of RAM and only a 2 MP camera. Not to worry though, the design will make up for those miserable specs.